ca. 495 – 429 B.C.E. Pericles (also spelled Perikles) (ca. 495–429 B.C.E., Greek: Περικλῆς, meaning "surrounded by glory") was a prominent and influential statesman, orator, and general of Athens during the city's Golden Age–specifically, the time between the Persian and Peloponnesian wars. He was descended, through his mother, from the powerful and historically influential Alcmaeonid family. Pericles had such a profound influence on Athenian society that Thucydides, his contemporary historian, acclaimed him as "the first citizen of Athens." Pericles turned the Delian League into an Athenian empire and led his countrymen during the first two years of the Peloponnesian War. The period during which he led Athens, roughly from 461 to 429 B.C.E., is sometimes known as the "Age of Pericles," though the period thus denoted can include times as early as the Greco-Persian Wars, or as late as the next century. 2 Political career until 431 B.C.E. Pericles promoted the arts and literature; this was a chief reason Athens holds the reputation as the educational and cultural centre of the ancient Greek world. He started an ambitious project that built most of the surviving structures on the Acropolis (including the Parthenon). This project beautified the city, exhibited its glory, and gave work to the people. Furthermore, Pericles fostered Athenian democracy to such an extent that critics call him a populist. Pericles was born around 495 B.C.E., in the deme of Cholargos just north of Athens.α[›] He was the son of the politician Xanthippus, who, although ostracized in 485–4 B.C.E., returned to Athens to command the Athenian contingent in the Greek victory at Mycale just five years later. 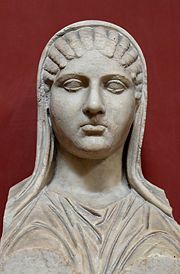 Pericles' mother, Agariste, was a scion of the powerful and controversial noble family of the Alcmaeonidae, and her familial connections played a crucial role in starting Xanthippus' political career. Agariste was the great-granddaughter of the tyrant of Sicyon, Cleisthenes, and the niece of the Supreme Athenian reformer Cleisthenes, another Alcmaeonid.β[›] According to Herodotus and Plutarch, Agariste dreamed, a few nights before Pericles' birth, that she had borne a lion. One interpretation of the anecdote treats the lion as a traditional symbol of greatness, but the story may also allude to the unusual size of Pericles' skull, which became a popular target of contemporary comedians. (Although Plutarch claims that this deformity was the reason that Pericles was always depicted wearing a helmet, this is not the case; the helmet was actually the symbol of his official rank as strategos (general)). "Our polity does not copy the laws of neighboring states; we are rather a pattern to others than imitators ourselves. It is called a democracy, because not the few but the many govern. If we look to the laws, they afford equal justice to all in their private differences; if to social standing, advancement in public life falls to reputation for capacity, class considerations not being allowed to interfere with merit; nor again does poverty bar the way, if a man is able to serve the state, he is not hindered by the obscurity of his condition." Pericles' Funeral Oration as recorded by Thucydides, 2.37γ[›]; Thucydides disclaims verbal accuracy. Pericles belonged to the local tribe of Acamantis (Ἀκαμαντὶς φυλὴ). His early years were quiet; the introverted, young Pericles avoided public appearances, preferring to devote his time to his studies. His family's nobility and wealth allowed him to fully pursue his inclination toward education. He learned music from the masters of the time (Damon or Pythocleides could have been his teachers) and he is considered to have been the first politician to attribute great importance to philosophy. He enjoyed the company of the philosophers Protagoras, Zeno of Elea and Anaxagoras. Anaxagoras in particular became a close friend and influenced him greatly. Pericles' manner of thought and rhetorical charisma may have been in part products of Anaxagoras’ emphasis on emotional calm in the face of trouble and skepticism about divine phenomena. His proverbial calmness and self-control are also regarded as products of Anaxagoras' influence. Political career until 431 B.C.E. In the spring of 472 B.C.E., Pericles presented the Persae of Aeschylus at the Greater Dionysia as a liturgy, demonstrating that he was then one of the wealthier men of Athens. Simon Hornblower has argued that Pericles' selection of this play, which presents a nostalgic picture of Themistocles' famous victory at Salamis, shows that the young politician was supporting Themistocles against his political opponent Cimon, whose faction succeeded in having Themistocles ostracized shortly afterwards. Plutarch says that Pericles stood first among the Athenians for 40 years. If this was so, Pericles must have taken up a position of leadership by the early 460s B.C.E. Throughout these years he endeavored to protect his privacy and tried to present himself as a model for his fellow citizens. For example, he would often avoid banquets, trying to be frugal. In 463 B.C.E. Pericles was the leading prosecutor of Cimon, the leader of the conservative faction, who was accused of neglecting Athens' vital interests in Macedon. Although Cimon was acquitted, this confrontation proved that Pericles' major political opponent was vulnerable. A modern statue of Pericles in modern Cholargos (Pericles' avenue). The name of the suburb dates to ancient Athens, but the ancient deme of Cholargos, which belonged to the tribe of Acamantis, was near modern Kamatero or Peristeri. Around 462–461 B.C.E. the leadership of the democratic party decided it was time to take aim at the Areopagus, a traditional council controlled by the Athenian aristocracy, which had once been the most powerful body in the state. The leader of the party and mentor of Pericles, Ephialtes, proposed a sharp reduction of the Areopagus’ powers. The Ecclesia (the Athenian Assembly) adopted Ephialtes' proposal without strong opposition. This reform signalled the commencement of a new era of "radical democracy". The democratic party gradually became dominant in Athenian politics and Pericles seemed willing to follow a populist policy in order to cajole the public. According to Aristotle, Pericles' stance can be explained by the fact that his principal political opponent, Cimon, was rich and generous, and was able to secure public favor by lavishly bestowing his sizable personal fortune. The historian Loren J. Samons, argues, however, that Pericles had enough resources to make a political mark by private means, had he so chosen. In 461 B.C.E., Pericles achieved the political elimination of this formidable opponent using the weapon of ostracism. The ostensible accusation was that Cimon betrayed his city by acting as a friend of Sparta. Even after Cimon's ostracism, Pericles continued to espouse and promote a populist social policy. He first proposed a decree that permitted the poor to watch theatrical plays without paying, with the state covering the cost of their admission. With other decrees he lowered the property requirement for the archonship in 458–457 B.C.E. and bestowed generous wages on all citizens who served as jurymen in the Heliaia (the supreme court of Athens) some time just after 454 B.C.E. His most controversial measure, however, was a law of 451 B.C.E. limiting Athenian citizenship to those of Athenian parentage on both sides. "Rather, the admiration of the present and succeeding ages will be ours, since we have not left our power without witness, but have shown it by mighty proofs; and far from needing a Homer for our panegyrist, or other of his craft whose verses might charm for the moment only for the impression which they gave to melt at the touch of fact, we have forced every sea and land to be the highway of our daring, and everywhere, whether for evil or for good, have left imperishable monuments behind us." Cimon, on the other hand, apparently believed that no further free space for democratic evolution existed. He was certain that democracy had reached its peak and Pericles’ reforms were leading to the stalemate of populism. According to Paparrigopoulos, history vindicated Cimon, because Athens, after Pericles' death, sank into the abyss of political turmoil and demagogy. Paparrigopoulos maintains that an unprecedented regression descended upon the city, whose glory perished as a result of Pericles' populist policies. According to another historian, Justin Daniel King, radical democracy benefitted people individually, but harmed the state. On the other hand, Donald Kagan asserts that the democratic measures Pericles put into effect provided the basis for an unassailable political strength. Cimon finally accepted the new democracy and did not oppose the citizenship law, after he returned from exile in 451 B.C.E. Ephialtes' murder in 461 B.C.E. paved the way for Pericles to consolidate his authority.δ[›] Lacking any robust opposition after the expulsion of Cimon, the unchallengeable leader of the democratic party became the unchallengeable ruler of Athens. He remained in power almost uninterruptedly until his death in 429 B.C.E. Pericles made his first military excursions during the First Peloponnesian War, which was caused in part by Athens' alliance with Megara and Argos and the subsequent reaction of Sparta. In 454 B.C.E. he attacked Sicyon and Acarnania. He then unsuccessfully tried to take Oeniadea on the Corinthian gulf, before returning to Athens. In 451 B.C.E., Cimon is said to have returned from exile to negotiate a five years' truce with Sparta after a proposal of Pericles, an event which indicates a shift in Pericles' political strategy. Pericles may have realized the importance of Cimon's contribution during the ongoing conflicts against the Peloponnesians and the Persians. Anthony J. Podlecki argues, however, that Pericles' alleged change of position was invented by ancient writers to support "a tendentious view of Pericles' shiftiness". Plutarch states that Cimon struck a power-sharing deal with his opponents, according to which Pericles would carry through the interior affairs and Cimon would be the leader of the Athenian army, campaigning abroad. If it was actually made, this bargain would constitute a concession on Pericles' part that he was not a great strategist. Kagan believes that Cimon adapted himself to the new conditions and promoted a political marriage between Periclean liberals and Cimonian conservatives. In the mid-450s the Athenians launched an unsuccessful attempt to aid an Egyptian revolt against Persia, which led to a prolonged siege of a Persian fortress in the Nile River Delta. The campaign culminated in a disaster on a very large scale; the besieging force was defeated and destroyed. In 451–450 B.C.E. the Athenians sent troops to Cyprus. Cimon defeated the Persians in the Battle of Salamis, but died of disease in 449 B.C.E. Pericles is said to have initiated both expeditions in Egypt and Cyprus, although some researchers, such as Karl Julius Beloch, argue that the dispatch of such a great fleet conforms with the spirit of Cimon's policy. Complicating the account of this complex period is the issue of the Peace of Callias, which allegedly ended hostilities between the Greeks and the Persians. The very existence of the treaty is hotly disputed, and its particulars and negotiation are equally ambiguous. Ernst Badian believes that a peace between Athens and Persia was first ratified in 463 B.C.E. (making the Athenian interventions in Egypt and Cyprus violations of the peace), and renegotiated at the conclusion of the campaign in Cyprus, taking force again by 449–448 B.C.E. John Fine, on the other hand, suggests that the first peace between Athens and Persia was concluded in 450–449 B.C.E., as a result of Pericles' strategic calculation that ongoing conflict with Persia was undermining Athens' ability to spread its influence in Greece and the Aegean. 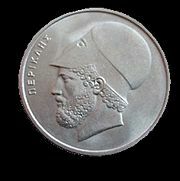 Kagan believes that Pericles used Callias, a brother-in-law of Cimon, as a symbol of unity and employed him several times to negotiate important agreements. In the spring of 449 B.C.E., Pericles proposed the Congress Decree, which led to a meeting ("Congress") of all Greek states in order to consider the question of rebuilding the temples destroyed by the Persians. The Congress failed because of Sparta's stance, but Pericles' real intentions remain unclear. Some historians think that he wanted to prompt some kind of confederation with the participation of all the Greek cities, others think he wanted to assert Athenian pre-eminence. According to the historian Terry Buckley the objective of the Congress Decree was a new mandate for the Delian League and for the collection of "phoros" (taxes). "Remember, too, that if your country has the greatest name in all the world, it is because she never bent before disaster; because she has expended more life and effort in war than any other city, and has won for herself a power greater than any hitherto known, the memory of which will descend to the latest posterity." During the Second Sacred War Pericles led the Athenian army against Delphi and reinstated Phocis in its sovereign rights on the oracle. In 447 B.C.E. Pericles engaged in his most admired excursion, the expulsion of barbarians from the Thracian peninsula of Gallipoli, in order to establish Athenian colonists in the region. At this time, however, Athens was seriously challenged by a number of revolts among its allies (or, to be more accurate, its subjects). In 447 B.C.E. the oligarchs of Thebes conspired against the democratic faction. The Athenians demanded their immediate surrender, but, after the Battle of Coronea, Pericles was forced to concede the loss of Boeotia in order to recover the prisoners taken in that battle. With Boeotia in hostile hands, Phocis and Locris became untenable and quickly fell under the control of hostile oligarchs. In 446 B.C.E., a more dangerous uprising erupted. Euboea and Megara revolted. Pericles crossed over to Euboea with his troops, but was forced to return when the Spartan army invaded Attica. Through bribery and negotiations, Pericles defused the imminent threat, and the Spartans returned home. When Pericles was later audited for the handling of public money, an expenditure of ten talents was not sufficiently justified, since the official documents just referred that the money was spent for a "very serious purpose." Nonetheless, the "serious purpose" (namely the bribe) was so obvious to the auditors that they approved the expenditure without official meddling and without even investigating the mystery. After the Spartan threat had been removed, Pericles crossed back to Euboea to crush the revolt there. He then inflicted a stringent punishment on the landowners of Chalcis, who lost their properties. The residents of Istiaia, meanwhile, who had butchered the crew of an Athenian trireme, were uprooted and replaced by 2000 Athenian settlers. The crisis was brought to an official end by the Thirty Years' Peace (winter of 446–445 B.C.E. ), in which Athens relinquished most of the possessions and interests on the Greek mainland which it had acquired since 460 B.C.E., and both Athens and Sparta agreed not to attempt to win over the other state's allies. In 444 B.C.E., the conservative and the democratic faction confronted each other in a fierce struggle. The ambitious new leader of the conservatives, Thucydides (not to be confused with the historian of the same name), accused Pericles of profligacy, criticizing the way he spent the money for the ongoing building plan. Thucydides managed, initially, to incite the passions of the ecclesia in his favor, but, when Pericles, the leader of the democrats, took the floor, he put the conservatives in the shade. Pericles responded resolutely, proposing to reimburse the city for all the expenses from his private property, under the term that he would make the inscriptions of dedication in his own name. His stance was greeted with applause, and Thucydides suffered an unexpected defeat. In 442 B.C.E., the Athenian public ostracized Thucydides for ten years and Pericles was once again the unchallenged suzerain of the Athenian political arena. Pericles wanted to stabilize Athens' dominance over its alliance and to enforce its pre-eminence in Greece. The process by which the Delian League transformed into an Athenian empire is generally considered to have begun well before Pericles' time, as various allies in the league chose to pay tribute to Athens instead of manning ships for the league's fleet, but the transformation was speeded and brought to its conclusion by measures implemented by Pericles. The final steps in the shift to empire may have been triggered by Athens' defeat in Egypt, which challenged the city's dominance in the Aegean and led to the revolt of several allies, such as Miletus and Erythrae. Either because of a genuine fear for its safety after the defeat in Egypt and the revolts of the allies, or as a pretext to gain control of the League's finances, Athens transferred the treasury of the alliance from Delos to Athens in 454–453 B.C.E. By 450–449 B.C.E. the revolts in Miletus and Erythrae were quelled and Athens restored its rule over its allies. Around 447 B.C.E. Clearchus proposed the Coinage Decree, which imposed Athenian silver coinage, weights and measures on all of the allies. According to one of the decree's most stringent provisions, surplus from a minting operation was to go into a special fund, and anyone proposing to use it otherwise was subject to the death penalty. It was from the alliance's treasury that Pericles drew the funds necessary to enable his ambitious building plan, centered on the "Periclean Acropolis," which included the Propylaea, the Parthenon and the golden statue of Athena, sculpted by Pericles’ friend, Phidias. In 449 B.C.E. 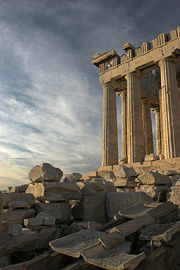 Pericles proposed a decree allowing the use of 9000 talents to finance the major rebuilding program of Athenian temples. Angelos Vlachos, a Greek Academician, points out that the utilization of the alliance's treasury, initiated and executed by Pericles, is one of the largest embezzlements in human history; this misappropriation financed, however, some of the most marvelous artistic creations of the ancient world. The Samian War was the last significant military event before the Peloponnesian War. After Thucydides' ostracism, Pericles was re-elected yearly to the generalship, the only office he ever officially occupied, although his influence was so great as to make him the de facto ruler of the state. In 440 B.C.E. Samos was at war with Miletus over control of Priene, an ancient city of Ionia on the foot-hills of Mycale. Worsted in the war, the Milesians came to Athens to plead their case against the Samians. When the Athenians ordered the two sides to stop fighting and submit the case to arbitration at Athens, the Samians refused. In response, Pericles passed a decree dispatching an expedition to Samos, "alleging against its people that, though they were ordered to break off their war against the Milesians, they were not complying".ε[›] In a naval battle the Athenians led by Pericles and the other nine generals defeated the forces of Samos and imposed on the island an administration pleasing to them. When the Samians revolted against Athenian rule, Pericles compelled the rebels to capitulate after a tough siege of eight months, which resulted in substantial discontent among the Athenian sailors. Pericles then quelled a revolt in Byzantium and, when he returned to Athens, he gave a funeral oration to honor the soldiers who died in the expedition. Between 438 B.C.E.-436 B.C.E. Pericles led Athens' fleet in Pontus and established friendly relations with the Greek cities of the region. Pericles focused also on internal projects, such as the fortification of Athens (the building of the "middle wall" about 440 B.C.E. ), and on the creation of new cleruchies, such as Andros, Naxos and Thurii (444 B.C.E.) as well as Amphipolis (437 B.C.E.-436 B.C.E.). Phidias, who had been in charge of all building projects, was first accused of embezzling gold intended for the statue of Athena, and then of impiety, because, when he wrought the battle of the Amazons on the shield of Athena, he carved out a figure that suggested himself as a bald old man, and also inserted a very fine likeness of Pericles fighting with an Amazon. Pericles' enemies also found a false witness against Phidias, named Menon. Aspasia, who was noted for her ability as a conversationalist and adviser, was accused of corrupting the women of Athens in order to satisfy Pericles' perversions. Aspasia was probably a hetaera and ran a brothel, although these allegations are disputed by modern scholars. The accusations against her were probably nothing more than unproven slanders, but the whole experience was very bitter for Pericles. Although Aspasia was acquitted thanks to a rare emotional outburst by Pericles, his friend, Phidias, died in prison and another friend of his, Anaxagoras, was attacked by the ecclesia for his religious beliefs. Beyond these initial prosecutions, the ecclesia attacked Pericles himself by asking him to justify his ostensible profligacy with, and maladministration of, public money. According to Plutarch, Pericles was so afraid of the oncoming trial that he did not let the Athenians yield to the Lacedaemonians. Beloch also believes that Pericles deliberately brought on the war to protect his political position at home. Thus, at the start of the Peloponnesian War, Athens found itself in the awkward position of entrusting its future to a leader whose preeminence had just been seriously shaken for the first time in over a decade. Pericles was convinced that the war against Sparta, which could not conceal its envy of Athens' pre-eminence, was inevitable if not to be welcomed. Therefore he did not hesitate to send troops to Corcyra to reinforce the Corcyraean fleet, which was fighting against Corinth. In 433 B.C.E. the enemy fleets confronted each other at the Battle of Sybota and a year later the Athenians fought Corinthian colonists at the Battle of Potidaea; these two events contributed greatly to Corinth's lasting hatred of Athens. During the same period, Pericles proposed the Megarian Decree, which resembled a modern trade embargo. According to the provisions of the decree, Megarian merchants were excluded from the market of Athens and the ports in its empire. This ban strangled the Megarian economy and strained the fragile peace between Athens and Sparta, which was allied with Megara. According to George Cawkwell, a praelector in ancient history, with this decree Pericles breached the Thirty Years Peace "but, perhaps, not without the semblance of an excuse". The Athenians' justification was that the Megarians had cultivated the sacred land consecrated to Demeter and had given refuge to runaway slaves, a behavior which the Athenians considered to be impious. After consultations with its allies, Sparta sent a deputation to Athens demanding certain concessions, such as the immediate expulsion of the Alcmaeonidae family including Pericles, and the retraction of the Megarian Decree, threatening war if the demands were not met. The obvious purpose of these proposals was the instigation of a confrontation between Pericles and the people; this event, indeed, would come about a few years later. At that time, the Athenians unhesitatingly followed Pericles' instructions. In the first legendary oration Thucydides puts in his mouth, Pericles advised the Athenians not to yield to their opponents' demands, since they were militarily stronger. Pericles was not prepared to make unilateral concessions, believing that "if Athens conceded on that issue, then Sparta was sure to come up with further demands." Consequently, Pericles asked the Spartans to offer a quid pro quo. In exchange for retracting the Megarian Decree, the Athenians demanded from Sparta to abandon their practice of periodic expulsion of foreigners from their territory (xenelasia) and to recognize the autonomy of its allied cities, a request implying that Sparta's hegemony was also ruthless. The terms were rejected by the Spartans, and, with neither side willing to back down, the two sides prepared for war. According to Athanasios G. Platias and Constantinos Koliopoulos, professors of strategic studies and international politics, "rather than to submit to coercive demands, Pericles chose war." Another consideration that may well have influenced Pericles' stance was the concern that revolts in the empire might spread if Athens showed herself weak. In 431 B.C.E., while peace already was precarious, Archidamus II, Sparta's king, sent a new delegation to Athens, demanding that the Athenians submit to Sparta's demands. This deputation was not allowed to enter Athens, as Pericles had already passed a resolution according to which no Spartan deputation would be welcomed if the Spartans had previously initiated any hostile military actions. The Spartan army was at this time gathered at Corinth, and, citing this as a hostile action, the Athenians refused to admit their emissaries. With his last attempt at negotiation thus declined, Archidamus invaded Attica, but found no Athenians there; Pericles, aware that Sparta's strategy would be to invade and ravage Athenian territory, had previously arranged to evacuate the entire population of the region to within the walls of Athens. "For heroes have the whole earth for their tomb; and in lands far from their own, where the column with its epitaph declares it, there is enshrined in every breast a record unwritten with no tablet to preserve it, except that of the heart." Witnessing the pillage of their farms, the Athenians were outraged, and they soon began to indirectly express their discontent towards their leader, who many of them considered to have drawn them into the war. Even in the face of mounting pressure, Pericles did not give in to the demands for immediate action against the enemy or revise his initial strategy. He also avoided convening the ecclesia, fearing that the populace, outraged by the unopposed ravaging of their farms, might rashly decide to challenge the vaunted Spartan army in the field. As meetings of the assembly were called at the discretion of its rotating presidents, the "prytanies," Pericles had no formal control over their scheduling; rather, the respect in which Pericles was held by the prytanies was apparently sufficient to persuade them to do as he wished. While the Spartan army remained in Attica, Pericles sent a fleet of 100 ships to loot the coasts of the Peloponnese and charged the cavalry to guard the ravaged farms close to the walls of the city. When the enemy retired and the pillaging came to an end, Pericles proposed a decree according to which the authorities of the city should put aside 1,000 talents and 100 ships, in case Athens was attacked by naval forces. According to the most stringent provision of the decree, even proposing a different use of the money or ships would entail the penalty of death. During the autumn of 431 B.C.E., Pericles led the Athenian forces that invaded Megara and a few months later (winter of 431 B.C.E.-430 B.C.E.) he delivered his monumental and emotional Funeral Oration, honoring the Athenians who died for their city. In 430 B.C.E., the army of Sparta looted Attica for a second time, but Pericles was not daunted and refused to revise his initial strategy. Unwilling to engage the Spartan army in battle, he again led a naval expedition to plunder the coasts of the Peloponnese, this time taking 100 Athenian ships with him. According to Plutarch, just before the sailing of the ships an eclipse of the moon frightened the crews, but Pericles used the astronomical knowledge he had acquired from Anaxagoras to calm them. In the summer of the same year an epidemic broke out and devastated the Athenians. The exact identity of the disease is uncertain, and has been the source of much debate.η[›] The city's plight, caused by the epidemic, triggered a new wave of public uproar, and Pericles was forced to defend himself in an emotional final speech, a rendition of which is presented by Thucydides. This is considered to be a monumental oration, revealing Pericles' virtues but also his bitterness towards his compatriots' ingratitude. Temporarily, he managed to tame the people's resentment and to ride out the storm, but his internal enemies' final bid to undermine him came off; they managed to deprive him of the generalship and to fine him at an amount estimated between 15 and 50 talents. Ancient sources mention Cleon, a rising and dynamic protagonist of the Athenian political scene during the war, as the public prosecutor in Pericles' trial. Nevertheless, within just a year, in 429 B.C.E., the Athenians not only forgave Pericles but also re-elected him as strategos.θ[›] He was reinstated in command of the Athenian army and led all its military operations during 429 B.C.E., having once again under his control the levers of power. In that year, however, Pericles witnessed the death of both his legitimate sons from his first wife, Xanthippus and his beloved Paralus, in the epidemic. His morale undermined, he burst into tears and not even Aspasia's companionship could console him. He himself died of the plague in the autumn of 429 B.C.E. Just before his death, Pericles' friends were concentrated around his bed, enumerating his virtues during peace and underscoring his nine war trophies. Pericles, though moribund, heard them and interrupted them, pointing out that they forgot to mention his fairest and greatest title to their admiration; "for," said he, "no living Athenian ever put on mourning because of me." 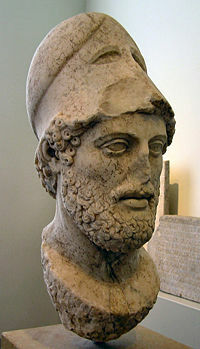 Pericles lived during the first two and a half years of the Peloponnesian War and, according to Thucydides, his death was a disaster for Athens, since his successors were inferior to him; they preferred to incite all the bad habits of the rabble and followed an unstable policy, endeavoring to be popular rather than useful. With these bitter comments, Thucydides not only laments the loss of a man he admired, but he also heralds the flickering of Athens' unique glory and grandeur. Pericles, following Athenian custom, was first married to one of his closest relatives, with whom he had two sons, Xanthippus and Paralus. This marriage, however, was not a happy one, and at some point near 445 B.C.E., Pericles divorced his wife and offered her to another husband, with the agreement of her male relatives. The name of his first wife is not known; the only information about her is that she was the wife of Hipponicus, before her marriage to Pericles, and the mother of Callias from this first marriage. "For men can endure to hear others praised only so long as they can severally persuade themselves of their own ability to equal the actions recounted: when this point is passed, envy comes in and with it incredulity." The woman he really adored was Aspasia of Miletus. She became Pericles' mistress and they began to live together as if they were married. This relationship aroused many reactions and even Pericles' own son, Xanthippus, who had political ambitions, did not hesitate to slander his father. Nonetheless, these persecutions did not undermine Pericles' morale, although he had to burst into tears in order to protect his beloved Aspasia when she was accused of corrupting Athenian society. His greatest personal tragedy was the death of his sister and of both his legitimate sons, Xanthippus and Paralus, all affected by the epidemic, a calamity he never managed to overcome. Just before his death, the Athenians allowed a change in the law of 451 B.C.E. that made his half-Athenian son with Aspasia, Pericles the younger, a citizen and legitimate heir, a decision all the more striking in consideration that Pericles himself had proposed the law confining citizenship to those of Athenian parentage on both sides. Pericles was a statesman, military leader and orator, who towered over a whole era, inspiring conflicting judgments from his supporters and detractors. 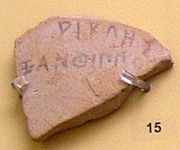 An ostracon with Pericles' name written on it (c. 444–443 B.C.E. ), Museum of the ancient Agora of Athens. Some contemporary scholars, for example Sarah Ruden, call Pericles a populist, a demagogue and a hawk, while other scholars admire his charismatic leadership. According to Plutarch, after assuming the leadership of Athens, "he was no longer the same man as before, nor alike submissive to the people and ready to yield and give in to the desires of the multitude as a steersman to the breezes". It is said that when his political opponent, Thucydides, was asked by Sparta's king, Archidamus, whether he or Pericles was the better fighter, Thucydides answered without any hesitation that Pericles was better, because even when he was defeated, he managed to convince the audience that he had won. In matters of character, Pericles was above reproach in the eyes of the ancient historians, since "he kept himself untainted by corruption, although he was not altogether indifferent to money-making". Thucydides, an admirer of Pericles, maintains that Athens was "in name a democracy but, in fact, governed by its first citizen". Through this comment, the historian illustrates what he perceives as Pericles' charisma to lead, convince and, sometimes, to manipulate. Although Thucydides mentions the fining of Pericles, he does not mention the accusations against Pericles but instead focuses on Pericles' integrity.ι[›] On the other hand, in one of his dialogues, Plato rejects the glorification of Pericles and quotes Socrates as saying: "As far as I know, Pericles made the Athenians slothful, garrulous and avaricious, by starting the system of public fees". Plutarch mentions other criticism of Pericles' leadership: "many others say that the people were first led on by him into allotments of public lands, festival-grants, and distributions of fees for public services, thereby falling into bad habits, and becoming luxurious and wanton under the influence of his public measures, instead of frugal and self-sufficing." Thucydides argues that Pericles "was not carried away by the people, but he was the one guiding the people". His judgment is not unquestioned; some twentieth century critics, such as Malcolm F. McGregor and John S. Morrison, proposed that he may have been a charismatic public face acting as an advocate on the proposals of advisors, or the people themselves. According to King, by increasing the power of the people, the Athenians left themselves with no authoritative leader. During the Peloponnesian War, Pericles' dependence on popular support to govern was obvious. For more than 20 years Pericles led numerous expeditions, mainly naval ones. Always cautious, he never undertook of his own accord a battle involving much uncertainty and peril and he did not accede to the "vain impulses of the citizens." He based his military policy on Themistocles' principle that Athens' predominance depends on its superior naval power and believed that the Peloponnesians were near-invincible on land. Pericles tried also to minimize the advantages of Sparta by rebuilding the walls of Athens. According to Josiah Ober, professor of classics in Princeton University, the strategy of rebuilding the walls radically altered the use of force in Greek international relations. "These glories may incur the censure of the slow and unambitious; but in the breast of energy they will awake emulation, and in those who must remain without them an envious regret. Hatred and unpopularity at the moment have fallen to the lot of all who have aspired to rule others." During the Peloponnesian War, Pericles initiated a defensive "grand strategy" whose aim was the exhaustion of the enemy and the preservation of the status quo. According to Platias and Koliopoulos, Athens as the strongest party did not have to beat Sparta in military terms and "chose to foil the Spartan plan for victory". The two basic principles of the "Periclean Grand Strategy" were the rejection of appeasement (in accordance with which he urged the Athenians not to revoke the Megarian Decree) and the avoidance of overextension.ια[›] According to Kagan, Pericles' vehement insistence that there should be no diversionary expeditions may well have resulted from the bitter memory of the Egyptian campaign, which he had allegedly supported. His strategy is said to have been "inherently unpopular," but Pericles managed to persuade the Athenian public to follow it. It is for that reason that Hans Delbrück called him one of the greatest statesmen and military leaders in history. Although his countrymen engaged in several aggressive actions soon after his death, Platias and Koliopoulos argue that the Athenians remained true to the larger Periclean strategy of seeking to preserve, not expand, the empire, and did not depart from it until the Sicilian Expedition. For his part, Ben X. de Wet concludes his strategy would have succeeded had he lived longer. Critics of Pericles' strategy, however, have been just as numerous as its supporters. A common criticism is that Pericles was always a better politician and orator than strategist. Donald Kagan called the Periclean strategy "a form of wishful thinking that failed," and Barry S. Strauss and Josiah Ober have stated that "as strategist he was a failure and deserves a share of the blame for Athens' great defeat." Kagan criticizes the Periclean strategy on four counts: first, that by rejecting minor concessions it brought about war; second, that it was unforeseen by the enemy and hence lacked credibility; third, that it was too feeble to exploit any opportunities; and fourth, that it depended on Pericles for its execution and thus was bound to be abandoned after his death. Kagan estimates Pericles' expenditure on his military strategy in the Peloponnesian War to be about 2000 talents annually, and based on this figure concludes that he would only have enough money to keep the war going for three years. He asserts that since Pericles must have known about these limitations he probably planned for a much shorter war. Others, such as Donald W. Knight, conclude that the strategy was too defensive and would not succeed. On the other hand, Platias and Koliopoulos reject these criticisms and state that "the Athenians lost the war only when they dramatically reversed the Periclean grand strategy that explicitly disdained further conquests." It is generally held that those succeeding him lacked his abilities and character. Painting of Hector Leroux (1682–1740), which portrays Pericles and Aspasia, admiring the gigantic statue of Athena in Phidias' studio. Thucydides' modern commentators are still trying to unravel the puzzle of Pericles' orations and to figure out if the wording belongs to the Athenian statesman or the historian.ιβ[›] Since Pericles never wrote down or distributed his orations,ιγ[›] no historians are able answer this with certainty; Thucydides recreated three of them from memory and, thereby, it cannot be ascertained that he did not add his own notions and thoughts.ιδ[›] Although Pericles was a main source of his inspiration, some historians have noted that the passionate and idealistic literary style of the speeches Thucydides attributes to Pericles is completely at odds with Thucydides' own reserved, analytical writing style.ιε[›] This might, however, be the result of the incorporation of the genre of rhetoric into the genre of historiography. That is to say, Thucydides could simply have used two different writing styles for two different purposes. Kagan states that Pericles adopted "an elevated mode of speech, free from the vulgar and knavish tricks of mob-orators" and, according to Diodorus Siculus, he "excelled all his fellow citizens in skill of oratory." According to Plutarch, he avoided using gimmicks in his speeches, unlike the passionate Demosthenes, and always spoke in a calm and tranquil manner. The biographer points out, however, that the poet Ion reported that Pericles' speaking style was "a presumptuous and somewhat arrogant manner of address, and that into his haughtiness there entered a good deal of disdain and contempt for others." Gorgias, in Plato's homonymous dialogue, uses Pericles as an example of powerful oratory. In Menexenus, however, Socrates casts aspersions on Pericles' rhetorical fame, claiming ironically that, since Pericles was educated by Aspasia, a trainer of many orators, he would be superior in rhetoric to someone educated by Antiphon. He also attributes authorship of the Funeral Oration to Aspasia and attacks his contemporaries' veneration of Pericles. Ancient Greek writers call Pericles "Olympian" and vaunt his talents, referring to him "thundering and lightening and exciting Greece" and carrying the weapons of Zeus when orating. According to Quintilian, Pericles would always prepare assiduously for his orations and, before going on the rostrum, he would always pray to the gods, so as not to utter any improper word. Sir Richard C. Jebb concludes that "unique as an Athenian statesman, Pericles must have been in two respects unique also as an Athenian orator; first, because he occupied such a position of personal ascendancy as no man before or after him attained; secondly, because his thoughts and his moral force won him such renown for eloquence as no one else ever got from Athenians." Pericles' most visible legacy can be found in the literary and artistic works of his Golden Age, most of which survive to this day. The Acropolis, though in ruins, still stands and is a symbol of modern Athens. Paparrigopoulos wrote that these masterpieces are "sufficient to render the name of Greece immortal in our world". In politics, Victor L. Ehrenberg argues that a basic element of Pericles' legacy is Athenian imperialism, which denies true democracy and freedom to the people of all but the ruling state. The promotion of such an arrogant imperialism is said to have ruined Athens. Nonetheless, other analysts maintain an Athenian humanism illustrated in the Golden Age. The freedom of expression is regarded as the lasting legacy deriving from this period. Pericles is lauded as "the ideal type of the perfect statesman in ancient Greece" and his Funeral Oration is nowadays synonymous with the struggle for participatory democracy and civic pride. ^ β: Plutarch says "granddaughter" of Cleisthenes, but this is chronologically implausible, and there is consensus that this should be "niece". ^ γ: Thucydides records several speeches which he attributes to Pericles; but Thucydides acknowledges that: "it was in all cases difficult to carry them word for word in one's memory, so my habit has been to make the speakers say what was in my opinion demanded of them by the various occasions, of course adhering as closely as possible to the general sense of what they really said." ^ δ: According to Aristotle, Aristodicus of Tanagra killed Ephialtes. Plutarch cites an Idomeneus as saying that Pericles killed Ephialtes, but does not believe him—he finds it to be out of character for Pericles. ^ ε: According to Plutarch, it was thought that Pericles proceeded against the Samians to gratify Aspasia of Miletus. ^ στ: Plutarch describes these allegations without espousing them. Thucydides insists, however, that the Athenian politician was still powerful. Gomme and Vlachos support Thucydides' view. ^ ζ: Vlachos maintains that Thucydides' narration gives the impression that Athens' alliance had become an authoritarian and oppressive empire, while the historian makes no comment for Sparta's equally harsh rule. Vlachos underlines, however, that the defeat of Athens could entail a much more ruthless Spartan empire, something that did indeed happen. Hence, the historian's hinted assertion that Greek public opinion espoused Sparta's pledges of liberating Greece almost uncomplainingly seems tendentious. Geoffrey Ernest Maurice de Ste Croix, for his part, argues that Athens' imperium was welcomed and valuable for the stability of democracy all over Greece. According to Fornara and Samons, "any view proposing that popularity or its opposite can be inferred simply from narrow ideological considerations is superficial". ^ η: Taking into consideration its symptoms, most researchers and scientists now believe that it was typhus or typhoid fever and not cholera, plague or measles. ^ θ: Pericles held the generalship from 444 B.C.E. until 430 B.C.E. without interruption. ^ ι: Vlachos criticizes the historian for this omission and maintains that Thucydides' admiration for the Athenian statesman makes him ignore not only the well-grounded accusations against him but also the mere gossips, namely the allegation that Pericles had corrupted the volatile rabble, so as to assert himself. ^ ια: According to Platias and Koliopoulos, the "policy mix" of Pericles was guided by five principles: a) Balance the power of the enemy, b) Exploit competitive advantages and negate those of the enemy, c) Deter the enemy by the denial of his success and by the skillful use of retaliation, d) Erode the international power base of the enemy, e) Shape the domestic environment of the adversary to your own benefit. ^ ιβ: According to Vlachos, Thucydides must have been about 30 years old when Pericles delivered his Funeral Oration and he was probably among the audience. ^ ιγ: Vlachos points out that he does not know who wrote the oration, but "these were the words which should have been spoken at the end of 431 B.C.E.". According to Sir Richard C. Jebb, the Thucydidean speeches of Pericles give the general ideas of Pericles with essential fidelity; it is possible, further, that they may contain recorded sayings of his "but it is certain that they cannot be taken as giving the form of the statesman's oratory". John F. Dobson believes that "though the language is that of the historian, some of the thoughts may be those of the statesman". C. M. J. Sicking argues that "we are hearing the voice of real Pericles," while Ioannis T. Kakridis claims that the Funeral Oration is an almost exclusive creation of Thucydides, since "the real audience does not consist of the Athenians of the beginning of the war, but of the generation of 400 B.C.E., which suffers under the repercussions of the defeat". Gomme disagrees with Kakridis, insisting on his belief to the reliability of Thucydides. ^ ιδ: That is what Plutarch predicates. Nonetheless, according to the tenth century encyclopedia Suda, Pericles constituted the first orator who systematically wrote down his orations. Cicero speaks about Pericles' writings, but his remarks are not regarded as credible. Most probably, other writers used his name. ^ ιε: Ioannis Kalitsounakis argues that "no reader can overlook the sumptuous rythme of the Funeral Oration as a whole and the singular correlation between the impetuous emotion and the marvelous style, attributes of speech that Thucydides ascribes to no other orator but Pericles". According to Harvey Yunis, Thucydides created the Pericles' indistinct rhetorical legacy that has dominated ever since. all links Retrieved July 20, 2009. ↑ Sarah Ruden. Lysistrata. (Hackett Publishing, 2003. ISBN 0872206033), 80. ↑ 4.0 4.1 4.2 4.3 4.4 "Pericles" Encyclopaedia Britannica (2002). ↑ 6.0 6.1 6.2 Plutarch, Pericles, III. ↑ Victor L. Ehrenberg. From Solon to Socrates. (Routledge (UK), 1990. ISBN 0415040248), a239. ↑ L. S. Cunningham and J. J. Reich. Culture and Values. (Thomson Wadsworth, 2005. ISBN 0534582281), 73. ↑ 9.0 9.1 9.2 9.3 9.4 9.5 9.6 9.7 "Pericles" in Encyclopaedia The Helios. (1952). ↑ Plutarch, Pericles, VI; and Plato, Phaedrus, 270a. ↑ Fornara and Samons, 67–73. ↑ Thomas R. Martin, An Overview of Classical Greek History. ↑ 26.0 26.1 K. Paparrigopoulos. History of the Greek Nation. Ab 145 (Eleftheroudakis) (in Greek). ↑ Jan M. Libourel, "The Athenian Disaster in Egypt," American Journal of Philology" 92 (4)(October 1971): 605–615. ↑ 41.0 41.1 Fine, 1983, 359–361. ↑ Ernst Badian, "The Peace of Callias," Journal of Hellenic Studies 107 (1987): 1–39. ↑ H. T. Wade-Grey, "The Question of Tribute in 449/8 B.C.E.". Hesperia 14 (3) (July-September 1945): 212–229. ↑ 46.0 46.1 46.2 Terry Buckley, Aspects of Greek History 750–323 B.C.E. (Routledge (UK), 1996. ISBN 0415099579), 206. ↑ 49.0 49.1 Fine, 1983, 368–369. ↑ T. Buckley, Aspects of Greek History 750–323 B.C.E., 204. ↑ Raphael Sealey. A History of the Greek City States, 700-338 B. C. (University of California Press, 1976. ISBN 0520031776), 275. ↑ Simon Hornblower. The Greek World 479–323 B.C.E. (Routledge (UK), 2002. ISBN 0415153441), 120. ↑ Jeffrey M. Hurwit. The Acropolis in the Age of Pericles. (Cambridge University Press, 2004. ISBN 0521820405), 87 etc. ↑ 67.0 67.1 Fornara-Samons, "Pericles' Political Career," in Athens from Cleisthenes to Pericles, 31.escholarship.org. ↑ 82.0 82.1 Athanasios G. Platias and Constantinos Koliopoulos. Thucydides on Strategy. (Eurasia Publications, 2006. ISBN 9608187168, 100–103. ↑ Malcomb F. McGregor, Government in Athens," in The Athenians and their Empire. (The University of British Columbia Press, 1987. ISBN 0774802693), 122–123. ↑ J. S. Morrison and A. W. Gomme, "Pericles Monarchos," Journal of Hellenic Studies 70 (1950): 76–77. ↑ 115.0 115.1 Platias and Koliopoulos, 98–99. ↑ 117.0 117.1 Platias and Koliopoulos, 119–120. ↑ B. X. de Wet, "This So-Called Defensive Policy of Pericles," Acta classica 12 (1969): 103–119. ↑ 121.0 121.1 121.2 K. Paparrigopoulos, Aa, 241–242. ↑ Donald Kagan. The Archidamian War. (Ithaca, NY: Cornell University Press, 1974. ISBN 080140889X), 28, 41. ↑ D. Knight, "Thucydides and the War Strategy of Pericles." Mnemosyne 23 (1970): 150–160. ↑ Donald Kagan. The Peloponnesian War. (Viking Adult, 2003. ISBN: 9780641654695). ↑ 138.0 138.1 Sir Richard C. Jebb, The Attic Orators. ↑ J. K. Davies. Athenian propertied families, 600–300 B.C.E. (Clarendon Press, 1971. ISBN 0198142730), 457. ↑ de Ste Croix, "The Character of the Athenian Empire." Historia III: 1–41. ↑ 153.0 153.1 Gomme, An Historical Commentary on Thucydides, Vol. II, 145–162. ↑ Platias and Koliopoulos, 104 etc. ↑ Dobson, The Greek Orators. All links Retrieved December 21, 2007. Aristophanes. The Acharnians. See original text in Perseus program. Aristotle: Constitution of the Athenians on Wikisource. See original text in Perseus program. Aristotle, Politika (Politics). See original text in Perseus program. Diodorus Siculus. Library, 12th Book. See original text in Perseus program. Herodotus, The Histories, VI. See original text in Perseus program. Plato, Alcibiades I. See original text in in Perseus program, from Plato, W. R. M. Lamb, trans. Plato in Twelve Volumes, Vol. 8. Cambridge, MA: Harvard University Press, 1955. ISBN 0674991842. Plato, Gorgias. See original text in Perseus program, from Plato. John Burnet, ed. Platonis Opera. Oxford University Press, 1903. Plato, Menexenus. See original text in Perseus program, from Plato. W. R. M. Lamb, trans., Plato in Twelve Volumes, Vol. 9 Harvard University Press, 1925. ISBN 0674991850. Plato, Phaedrus, See original text in Perseus program, from Plato and John Burnet, ed. Platonis Opera. Oxford University Press, 1903. Plutarch, Cimon. See original text in Perseus program. Thucydides: History of the Peloponnesian War on Wikisource, I-III. See original text in Perseus program. Xenophon (? ), Constitution of Athens. See original text in Perseus program. Aird, Hamish. Pericles: The Rise and Fall of Athenian Democracy. The Rosen Publishing Group, 2004. ISBN 082393828X. Badian, E. "The Peace of Callias." Journal of Hellenic Studies 107 (1987): 1–39. Beloch, (Karl) Julius. (1884). Die Attische Politik seit Perikles. Leipzig (in German). __________. (1893). Griechische Geschichte. Volume II (in German). de Blois, Lukas. An Introduction to the Ancient World. Routledge (UK), 1997. ISBN 0415127742. Buckley, Terry. Aspects of Greek History 750-323 B.C.E. Routledge (UK), 1996. ISBN 0415099579. Butler, Howard. The Story of Athens: A Record of the Life and Art of the City of the Violet Crown, Read in Its Ruins and in the Lives of Great Athenians. (original 1902) reprint ed. Kessinger Publishing, 2005. ISBN 1417970928. Cawkwell, George. Thucydides and the Peloponnesian War. Routledge (UK), 1997. ISBN 0415165520. Cunningham Lawrence S., and John J. Reich. Culture And Values. Thomson Wadsworth, 2005. ISBN 0534582281. Davis, John Kenyon. Athenian propertied families, 600-300 B.C.E. Clarendon Press, 1971. ISBN 0198142730. Delbrück, Hans. History of the Art of War. (original 1920), Reprint ed. University of Nebraska Press, 1990. Vol 1. Translated by Walter, J. Renfroe. Dobson, J. F., "Pericles as an orator", The Greek Orators. London: Methuen. [July 1919]. . Retrieved 2007-01-12. Encyclopaedic Dictionary The Helios. Volume VIII. article: "The Funeral Speech over the Fallen." Volume XV. article: "Pericles" (in Greek). Ehrenberg, Victor L. From Solon to Socrates. Routledge (UK), 1990. ISBN 0415040248. Fine, John V. A. The Ancient Greeks: A critical history. Harvard University Press, 1983. ISBN 0674033140. Fornara Charles W., and Loren J. Samons, II. Athens from Cleisthenes to Pericles. Berkeley: University of California Press, 1991. Gomme, A. W. (A. Andrewes and K. J. Dover). An Historical Commentary on Thucydides (I-V). Oxford University Press, (1945–1981). ISBN 019814198X. Henri, Madeleine M. Prisoner of History. Aspasia of Miletus and her Biographical Tradition. Oxford University Press, 1995. ISBN 0195087127. Hornblower, Simon. The Greek World 479-323 B.C.E.. Routledge (UK), 2002. ISBN 0415153441. Hurwit, Jeffrey M. The Acropolis in the Age of Pericles. Cambridge University Press, 2004. ISBN 0521820405. Just, Roger. Women in Athenian Law and Life. Routledge (UK), 1991. ISBN 0415058414. Kagan, Donald, "Athenian Strategy in the Peloponnesian War", The Making of Strategy: Rules, States and Wars. edited by Williamson Murray, Alvin Bernstein, MacGregor Knox. Cambridge University Press, 1996. ISBN 0521566274. __________. The Archidamian War. Ithaca, NY: Cornell University Press, 1974. ISBN 080140889X. __________. The Outbreak of the Peloponnesian War. Ithaca, NY: Cornell University Press, 1989. ISBN 0801495563. __________. The Peloponnesian War. Viking Adult, 2003. ISBN: 9780641654695. __________. "War aims and resources (432–431)", The Peloponnesian War. Viking Penguin (Penguin Group), 2003. ISBN 0670032115. Kakridis, Ioannis Th. Interpretative Comments on the Pericles' Funeral Oration. Estia, 1993. (in Greek). Katula, Richard A. "The Origins of Rhetoric", A Synoptic History of Classical Rhetoric. by James J. Murphy, Richard A. Katula, Forbes I. Hill, Donovan J. Ochs. Lawrence Erlbaum Associates, 2003. ISBN 1880393352. Knight, D. W., "Thucydides and the War Strategy of Pericles." Mnemosyne 23 (1970): 150–160. Libourel, Jan M., "The Athenian Disaster in Egypt." American Journal of Philology" 92 (4)(October 1971): 605–615. Loraux, Nicole. "Aspasie, l'étrangère, l'intellectuelle", La Grèce au Féminin. (in French). Belles Lettres, 2003. ISBN 2251380485. Mattson, Kevin. Creating a Democratic Public. Penn State Press, 1998. ISBN 0271017236. McGregor, Malcolm F. "Government in Athens", The Athenians and their Empire. The University of British Columbia Press, 1987. ISBN 0774802693. Mendelson, Michael. Many Sides: A Protagorean Approach to the Theory, Practice, and Pedagogy of Argument. Springer, 2002. ISBN 1402004028. Monoson, Sara. Plato's Democratic Entanglements. Princeton University Press, 2000. ISBN 0691043663. Morrison, J.S., "Pericles Monarchos." Journal of Hellenic Studies 70 (1950): 76–77. Ober, Josiah. "National Ideology and Strategic Defense of the Population, from Athens to Star Wars", Hegemonic Rivalry: From Thucydides to the Nuclear Age. Westview Press, 1991. ISBN 0813377447. __________ . The Athenian Revolution. Princeton, NJ: Princeton University Press, 1996. ISBN 0691010951. Paparrigopoulos, Konstantinos (-Karolidis, Pavlos)(1925), History of the Hellenic Nation. (Volume Ab). Eleftheroudakis (in Greek). Platias Athanasios G., Koliopoulos Constantinos. Thucydides on Strategy. Eurasia Publications, 2006. ISBN 9608187168. "Pericles". Oxford Classical Dictionary, edited by Simon Hornblower and Antony Spawforth. 1996. Podlecki, Anthon J. Perikles and His Circle. Routledge (UK), 1997. ISBN 0415067944. Power, Edward J. A Legacy of Learning. SUNY Press, 1991. ISBN 0791406105. Rhodes, P. J. A History of the Classical Greek World. Blackwell Publishing, 2005. ISBN 0631225641. Ruden, Sarah. Lysistrata. Hackett Publishing, 2003. ISBN 0872206033. Samons, Loren J. "The Peloponnesian War", What's Wrong with Democracy? Los Angeles: University of California Press, 2004. ISBN 0520236602. Sealey, Raphael. "The Peloponnesian War", A History of the Greek City States, 700-338 B. C. University of California Press, 1976. ISBN 0520031776. Shrimpton, G. Theopompus The Historian. McGill-Queen's Press - MQUP, 1991. ISBN 0773508376. Sicking, C. M. J. Distant Companions: Selected Papers. Brill Academic Publishers, 1998. ISBN 9004110542. Smith, William (1855). "Death and Character of Pericles", A History of Greece. R. B. Collins. Starr, Chester G. A History of the Ancient World. New York: Oxford University Press USA, 1991. ISBN 0195066286. Strauss, Barry S., and Josiah Ober. The Anatomy of Error: Ancient Military Disasters and Their Lessons for Modern Strategists. St Martins Press, 1990. ISBN 0312050518. Tuplin, Christopher J. Pontus and the Outside World. Brill Academic, 2004. ISBN 9004121544. Vlachos, Angelos. Remarks on Thucydides' History of the Peloponnesian War (Α΄-Δ΄). Volume I. Estia, 1992 (in Greek). __________ . Thucydides' bias. Estia, 1974. (in Greek). Wade-Grey, H. T., "The Question of Tribute in 449/8 B. C.". Hesperia 14 (3) (July-September 1945): 212–229. de Wet, B. X., "This So-Called Defensive Policy of Pericles." Acta classica 12 (1969): 103–119. Yunis, Harvey. Taming Democracy. Cornell University Press, 1996. ISBN 0801483581. Brock Roger, Hodkinson Stephen. Alternatives to Athens: Varieties of Political Organization and Community in Ancient Greece. Oxford University Press, 2003. ISBN 0199258104. Gardner, Percy. (1902). Ancient Athens. Grant, Arthur James. Greece in the Age of Pericles. John Murray, 1893. Hesk, John. Deception and Democracy in Classical Athens. Cambridge University Press, 2000. ISBN 0521643228. Kagan, Donald. Pericles of Athens and the Birth of Democracy. The Free Press, 1991. ISBN 0684863952. Lummis, Douglas C. Radical Democracy. Cornell University Press, 1997. ISBN 0801484510. Ober, Josiah. Political Dissent in Democratic Athens: Intellectual Critics of Popular Rule. Princeton University Press, 2001. ISBN 0691089817. Rhodes, P. J. A History of the Classical Greek World: 478-323 B.C.E.. Blackwell Publishing, 2005. ISBN 063122565X. Whibley, Leonard. A History of the Classical Greek World: 478-323 B.C.E.. University Press, 1889. Vidal, Gore. Creation. (novel) for a fictional account of Pericles and a Persian view of the wars. This page was last modified on 7 February 2019, at 18:31.